It’s the game show revival that everyone’s been waiting for. The best part of any one of those television talent shows, like American Idol or America’s Got Talent, are the episodes in which the talentless freaks come out, do their weird dog and pony show, then disappear back into the wider world. Those episodes are great. Once upon a time, there was a show where only the freaks tried out. The Gong Show, which was hosted by CIA assassin Chuck Barris, was a celebration of all things weird and wonderful. Now, The Gong Show is returning, this time as a live stage extravaganza. Now, after calling the show’s producers and getting the approval, The Gong Show Live is hitting the stage. The show will take place on October 31 at the B.B. King Blues Club & Grill in Times Square. 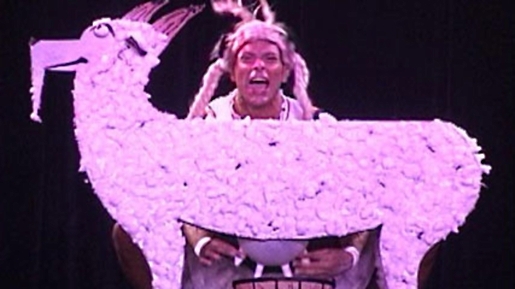 It’s a celebration of those who can’t sing like Whitney Houston, only think they can yodel while milking a papier mache goat dressed like Heidi.